Dog lovers will advise you to adopt. Animal advocates will chant the mantra, "Adopt, don't shop!" But no one can convince another individual about the beauty of adoption better than someone that has experienced it firsthand. The following is a tale of one such adoption - a rescuing of both an emotionally devastated family, and that of a homeless dog with a sad past. 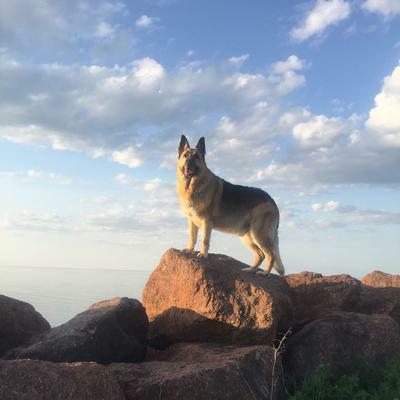 The Leger family lost a treasured companion and friend in the Spring of 2010 - a German shepherd named Hope that died suddenly from cancer of the spleen. Though the family was crushed, they knew that they had to adopt another dog and they had to do it soon. Waking up without a shepherd by their side was simply put, too difficult to do. The family had another 4-legged companion to consider in their quest for a new dog. Mitaine, a 17 yr-old Terripoo, had relied on Hope for friendship and more - Mitaine's eyes and ears were failing and the now deceased dog had been the senior's stand-in guide. The Leger family turned their quest for a new companion into a full time job. Hours were spent scouring the internet for adoptable dogs. Miles were driven as dog after dog was met. Unfortunately, Mitaine was not finding that bond with the dogs that were on the list of hopefuls. In fact, Mitaine greeted most of those hopeful dogs with barking and growling - the old dog was not pleased with her options thus-far. The family was committed to their search, however, and they did not give up the hope that 'the one' would be found. Then it happened - a German shepherd that had been housed at a high-kill shelter in Tennessee was rescued and taken to Bedford, NS. The family made a 3 hour trek to meet this dog - hoping against hope that he would speak to all of their hearts. And speak he did. The dog was emaciated, had broken teeth, a scarred nose and suffered from severe diarrhea - he was the most beautiful dog that the family had seen. Though the Legers were in love, they worried that Mitaine would not be - after all, she had not approved of any of the many other dogs that they had met to date. Would she squelch their hopes? Only a one-on-one meeting would determine the homeless dog's fate. Mitaine gave her answer to her family in no uncertain terms - she walked to the battered dog and lay down by his side, sighing. The family adopted the dog - his name is Shiloh, meaning "he who was sent". His melding into their family was slow - he past was obviously painful and he had both physical and emotional scars to overcome. But overcome he did. He went from a painfully thin weight of 78 lbs to a healthy 105 lbs. He learned that toys were for playing with and the immense sadness in his eyes slowly started to fade. With each passing day, as Shiloh was able to enjoy swimming and hiking, as well as the comfort of knowing safety, and love, the once neglected dog found a purpose to his life. His family gave him the desire to get up each morning. Love made him do more than breathe - it made him begin to live. Today, the Leger family is blessed by a dog that makes them laugh each and every day. Their newest family member has also become a constant companion to the finnicky senior, Mitaine. Though Shiloh's past makes the family fleetingly sad, they also know that every living creature - having lived long enough, will experience hard times. They take solace knowing that there are no more sad times for Shiloh - he is destined to live the remainder of his life safely in the loving arms of his family. The Legers firmly believe that Shiloh came to them for a purpose. Andrea Leger lost her son back in 1995. For the first time in 15 years, she is looking forward to the holidays - something she fully attributes to Shiloh and his presence in her family's life. I thought I was rescuing Shiloh, but I realize he has rescued me from a deep sadness that has become gratefulness for having such a great friend...my bestest buddy Shiloh ! If you are planning to share your home with a dog, please consider adopting an adult dog. So many dogs out there need good homes. Rescues expect nothing and appreciate everything. A simply amazing story. I know there are many out there with regards to pet adoption but this one tugs at your heart in a way that can never be forgotten. I wish I could of known Shiloh. Maybe somewhere between the tears I expressed reading this incredible story our hearts met for awhile. Look not with your eyes but with your heart for they are all there...all of them forever. I have know Andrea Leger for sometime through Facebook. And have always lived vicariously through her and Shiloh's adventures and just everyday life. Walk-a Walk-a's my favorite. Shiloh's story is the poster form of how all adopted dogs should end up living. Her new little Harvey was also adopted. I can't wait for a lifetime of adventures the future holds for little as it Harvey and Andrea. Miss you Shiloh. world .Shilo the shelter dog abandoned at the high kill shelter as if he meant nothing became everything to not only his family but everyone who knew of him as well .The world cried when the "King" was called to the bridge.Rest easy Shiloh we will never forget you. LUV paws and missing you Sir Shiloh Leger - but we all know you're not far from your mamma <3 rest easy big boy hoping you found My Kolby and Toby and Play BALL <3 stay close until me meet again!